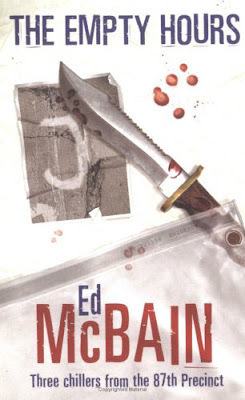 The Empty Hours departs from Ed McBain’s usual winning formula; rather than a police procedural novel, The Empty Hours is a collection of three novellas. The Empty Hours (the first story also serving as the title of the collection) concerns the discovery of a decomposed body in a furnished room in a slum. The body is that of a wealthy heiress – what was she doing living in a dive on South Eleventh? The City doesn’t seem to be itself in the very early hours of the morning. McBain continues on in a similar vein for another page and a half. With the exception of such anthropomorphic meanderings, The Empty Hours is very tightly plotted, and one of the best 87th Precinct mysteries that El Tarangu has yet read. J, the second story, deals with the murder of a rabbi. The nature of the victim results in Meyer Meyer playing a central role in the investigation. J is good in that the reader gets more of an insight into Meyer than they usually get, but the story is resolved a little too quickly for our liking. Not bad; not great, either. Storm represents the greatest departure from the 87th Precinct conventions, as the story, *gasp*, doesn’t even take place anywhere near Isola. Cotton Hawes is taking his lady friend, Blanche Colby, up to the ski resort of Rawson for the weekend. But the romantic tryst is disrupted when someone is murdered on the ski-lift. And Hawes steps all over the toes of the local law enforcement during the course of his unofficial investigation into the murder, big-city, out-of-jurisdiction detective that he is. After some initial macho territorial posturings from both Hawes and the local sheriff, the two strike an accord and agree to work together to capture the killer. Blanche, needless to say, has her holiday ruined. Storm was an entertaining foray into the whodunit genre from McBain, and we were left wishing that the story had been longer once we had finished it. Verdict on the collection as a whole: highly recommended. Buy The Empty Hours from Amazon.